What Caused the Apollo 13 Accident? CAPE CANAVERAL, Fla. All you had to do was hear Jim Lovell’s voice and you knew it was something bad. "It looks to me that we are venting something," came Lovell's report from Apollo 13. "We're venting something out into space. It's a gas of some sort." When a tank full of liquid oxygen inside Apollo 13s service module ruptured with a muffled bang, engineers and technicians at the Kennedy Space Center (KSC) could hear the tone in Lovell’s problem report and wasted no time jumping into action. "Everyone started looking at data," remembered Wendt, "and saying Where could it be? How could it be? and What can we do?" At the time of Apollo 13 Wendt was working for North American Rockwell, the prime contractor for the Apollo command and service modules, which were crippled by the explosion. Special Report: Learn more about the Apollo program. There was the possibility that something hadn't been done correctly at KSC in preparing Apollo 13 for its mission. However, neither Wendt nor his colleagues wanted to believe they were at fault, and no one wasted any time doing so. Wendt told SPACE.com that once the emergency began, he didn't have time to dwell on the emotions of the moment. "You don't think so much as to how do you feel or what it means. You have a job." George English, a retired senior NASA manager at KSC, agrees. "The feeling was more ‘What the hell can we do to fix the problem?’ than there was worrying about recriminations or doing any soul searching." For Wendt, and English, and everyone else working on the Apollo program, the next several days were filled with intense effort to avert tragedy and save the lives of Jim Lovell and his crew. Once the astronauts were safely back on Earth, engineers began working to understand the causes of the accident, to prevent it from happening again. Within weeks, review teams had constructed a clear picture of the events that created this near-disaster. The series of events that led to Apollo 13’s life-and-death drama began five years earlier with a simple design change to the Apollo spacecraft. During flight, the systems aboard the command and service modules were designed to operate at 28 volts. In 1965, however, it became clear that during preflight tests at the Kennedy Space Center, 65 volts would be used. That year, engineers at North American directed that the craft's electrical components be redesigned to accept both levels of voltage. But one crucial participant never got word of the change. Within the service module were two tanks of liquid oxygen. Oxygen from these tanks was used not only for the astronauts to breathe, but to help run three fuel cells that provided electrical power to run the command ship's many systems. Inside each oxygen tank was a thermostat which, along with a heater, was used to regulate the temperature inside the tank. It was the manufacturer of this thermostat that never learned of the need to accept 65 volts of electricity. All things being equal, that might not have been a problem. In fact, the oxygen tanks used on all previous Apollo missions had flown without trouble. But the Number 2 oxygen tank aboard Apollo 13 did have a slightly tarnished history. In October 1968, the Number 2 tank eventually used on Apollo 13 was at the North American Aviation plant in Downey, California. There, technicians who were handling the tank accidentally dropped it about two inches. After testing the tank, they concluded the incident hadn't caused any detectable damage. The dropped tank was eventually cleared for flight and installed in Apollo 13. The tank passed all of its routine prelaunch tests. But at the end of March 1970, after a practice session called the Countdown Demonstration Test, ground crews tried to empty the tank -- and couldn’t. The small tube used to fill and empty the tank of its super-cold contents had been damaged by the mishandling almost two years earlier. To get around the problem, workers turned on heaters inside the tank to warm up the remaining liquid oxygen, turning it into gas that could then be vented to the outside. The thermostat inside the tank was supposed to prevent the temperature from exceeding 80 degrees Fahrenheit (25 degrees Centigrade). But as the temperature inside the tank rose, the thermostat was activated, and the oversight from 1965 came into play. The resulting surge of electricity at 65 volts caused the 28-volt thermostat to weld shut. Technicians failed to notice the situation, and during the procedure to empty the tank, temperatures inside rose to 1,000 degrees Fahrenheit (500 degrees Centigrade). The intense heat damaged some insulation on wiring inside the tank. 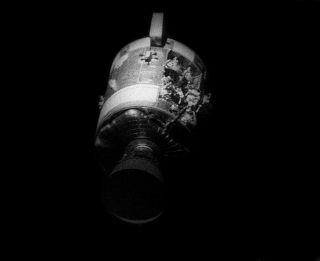 No one knew it, but when Apollo 13 lifted off, it carried the makings of a small bomb inside its service module. The "bomb" was triggered on the evening of April 13 when ground controllers asked Jack Swigert to turn on the fans inside the service module's two liquid-oxygen tanks, as a way of stirring the contents, to allow more accurate quantity readings. When the fan inside the Number 2 tank was turned on, the damaged wiring caused a spark, starting a fire inside the oxygen tank. With pure oxygen feeding the fire, the pressure inside quickly grew to the point where the tank burst open, at the same time damaging much of the other plumbing inside the densely packed service module and crippling the spacecraft. Guenter Wendt explains, "That thing just cooked and burned up. And that's what caused the thing to blow." In the wake of Apollo 13, engineers redesigned the oxygen tanks to prevent similar accidents. Also, a third oxygen tank was added to the service module, as an additional backup. Eight more Apollo spacecraft flew and none of them experienced the same trouble again.